It's Romance Brought to Light! Creativity and romance merge when stylist/writer, Stacy Kunstel, and her photographer husband, Michael Partenio, join forces to create an American made line of home accessories. (3BL Media / theCSRfeed) February 15, 2012 -- “We tend to think of romance first and let the story evolve around it,” waxes Stacy Kunstel when asked about what inspires Dunes and Duchess’ “wildly romantic products” for the home like this “Double Rachel” wall sconce, our Greenspiration Home American Made Pick-of-the-Week. 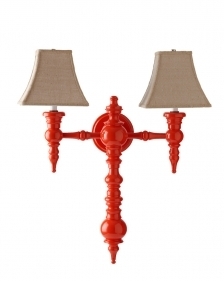 The Double Rachel Sconce was originally created for the Captain Fairfield Inn in Maine but has become one of Duchess and Dunes' most favored products among interior designers. We, too, love the versatility of this piece, which fits as well in a classic Cape Cod beach house as it does a traditional Italianate style home in Savannah. Speaking of romance, Duchess and Dunes is the offspring of the marriage of stylist/editor Stacy Kunstel and photographer, Michael Partenio. If you want to be wowed by some fabulous photography of some sensational interiors, you simply must check out Michael’s online portfolio. And, as homes editor for New England Home magazine and regional editor for several other national home magazines, Stacy is simply all over the place, even making television appearances to talk about all things…well, stylish. They seem like the quintessential power couple, but when it comes to their line of home accessories, these two are very hands-on. Production of the accessories starts in their home. “At this point in our existence we handle every piece that is shipped to a customer and we complete many of the finishing details ourselves in our expanded home workshop. We are just getting ready to take on some part-time help now,” said Stacy. That’s one small carbon footprint. Duchess and Dunes accessories can be found in retail shops from Nantucket to Seattle. The company is always introducing new products, including the launch of a chair, new lamps and a table at the recent New York International Gift Fair this past January. Fans can also look for some bolder colors for this coming spring and summer. “After such a snowless, brown winter we desperately needed color in our lives, so for spring-summer 2012 we introduced No Scurvy Lemon, the brightest yellow you can imagine, and Cap Ferrat Bleu, inspired by a trip to the south of France last fall," teases Stacy.